My dog recently is experiencing a very nasty problem and I was wondering if you could help me out. 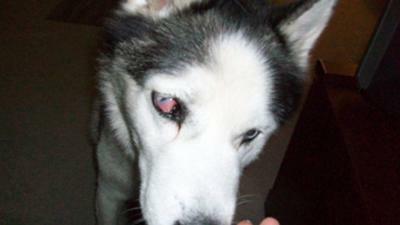 He is a 12 year old Siberian husky with no health problems. For last 2 weeks he has been experiencing progressively right eye redness . Also there appears to be a membrane that is covering his eyeball( half of it , starting from the nasal side corner , progressing laterally towards the ear). Furthermore, his eyeball is dislocated and protrudes from the eye socket.Also, in the nasal corner of the same eye there appears to be some dry blood. Furthermore, there is a bulge on the nasal bridge on the side of the affected eye . He is not in pain and does not experience any change in behavior. He also saw a vet who was clue less and started him on cephalosporin 200mg twice daily ( he has been on it for 2 weeks with no significant improvement ) . I would greatly appreciate if you could help me out since I have no idea what to do with this. I am afraid I cannot determine exactly what is going on with your dog based on your pictures and description, but I am quite concerned about your dog’s wellbeing. It sounds as if he might have a mass of some sort that is pushing on his eye and causing disfigurement of nearby structures (his nose). A mass like this could be associated with an infection, cancer, immune disorder, or other conditions. 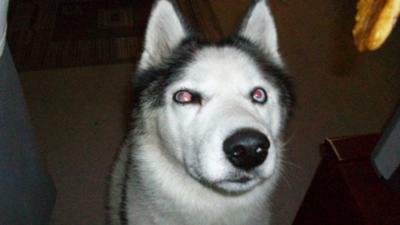 It is also possible that your dog has glaucoma (elevated eye pressure). The membrane that you are seeing is his third eyelid (nictitating membrane). It can become elevated out of its normal position with many different disorders affecting the eye. If your current veterinarian is unable to help you, a second opinion would be well worth the time and expense.